As I write this, Spring finally appears to have sprung. There are daffodils appearing in places I never planted them in the garden, doves are waking me up in the early hours of the morning with their relentless cooing, and hay fever has already shown itself to be as unpleasant as ever. It’s also the first opportunity to take the roof off the car and cruise around with the sun shining on my head and the breeze ruffling what’s left of my hair. Unfortunately, the only car I have that can have its roof removed is currently off the road, but fortunately Audi stepped in and gave me the keys to their new A3 Cabriolet. Based around the MQB architecture that underpins countless Volkswagens and Audis, the new A3 Cabriolet is longer, wider and stronger than the old model, while also being lighter with lower emissions and improved fuel economy. The wheelbase is extended by 17mm, freeing up just a little more room inside, something that’s quite apparent when moving in to the rear seats. There’s a sensible sized boot in place too, with 320 litres of storage available when the roof is up – enough for a couple of sets of golf clubs. Fold the fabric roof down and that reduces a little but it’s still useable. Inside it’s all as you would expect to find in any of the A3s that come with a fixed roof. That means it’s all high quality with excellent ergonomics. An LCD screen slides out of the top of the dashboard to provide you with sat-nav instructions and access to all the car settings, controlled by a rotary controller between the seats. It’s overwhelming initially, but you soon get used to it, switching between settings in a flash. A number of physical shortcut buttons around the controller help. A single bank of switches also sits on the dashboard, offering immediate access to a limited number of functions, while traditional knobs control the temperature of the air coming through the standard climate control system. In the back are just two seats, making this a strict four-seater; something to bear in mind if you need that middle seat for occasional journeys. That decision frees up a lot of shoulder room, so there’s no need to get too friendly with another rear passenger. Roof up, things obviously get a little tighter, but there’s still plenty of space if not quite so much light. There’s also a big enough aperture to clamber in to the rear with the roof in place. 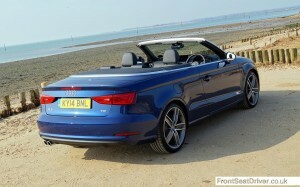 Once the roof is up, you’d be forgiven for forgetting you were in a convertible, such is the level of fit and finish. Only when glancing in the mirror does the tiny rear window give the game away. The solution is to put the roof down again, something that can be done at speeds of up to 30 mph, although the 18 seconds it takes feels a very long time when you’re casually, but very self-consciously, doing that down Huntingdon high street. It’s with the roof down that you’d expect any shortcomings in the chassis to show through, but the A3 Cabriolet feels remarkably stiff. The front end grips particularly well, allowing you to direct the car accurately and confidently, while the Sport suspension that sees spring rates increased and the ride height dropped offers a fine balance between sporty sensations and refined comfort. There’s nothing in the way of flex of scuttle shake under normal driving conditions either, even with the firmer and lower Sport suspension fitted, with just a smidgen of movement being detectable when treating the car like a go-kart. Most people will never notice that though, as it’s really not a car for setting lap records around Silverstone, especially when combined with the 2.0 litre diesel engine in my test model. This smooth and refined four-cylinder unit produces a reasonable 148 bhp but combines that with a very useable 320 Nm of torque. That’s enough to propel the A3 to 60 miles per hour in just under nine seconds while returning, officially at least, 67.3 mpg. During my time with the car, when it ventured all the way to the south coast (it was sunny, after all) the on board computer indicated an impressive 48 mpg. A CO2 figure of 110 g/km gives a BIK burden of 18%, which translates to an annual company car tax bill of £2,003 for a 40% tax payer with the standard Sport model, but beware the options list – even the excellent wind deflector costs an extra £290 while the satellite navigation option will add a further £1,495. Elsewhere in the range there’s a 1.4-litre litre petrol engine that returns 56.5 mpg and slightly higher CO2 emissions of 114 g/km, as well as a higher performance 1.8-litre petrol unit that is combined with a 7-speed dual-clutch automatic gearbox. A hot 300 bhp S3 version will be following soon. Audi has produced a high-quality, relatively spacious, reasonably powerful and quite engaging car that ticks many boxes while also, at least in the 2.0 TDI guise, managing to pull off class leading emissions and economy. It’s a genuinely superb all-rounder that warrants attention. And with the roof down, you’ll get it.